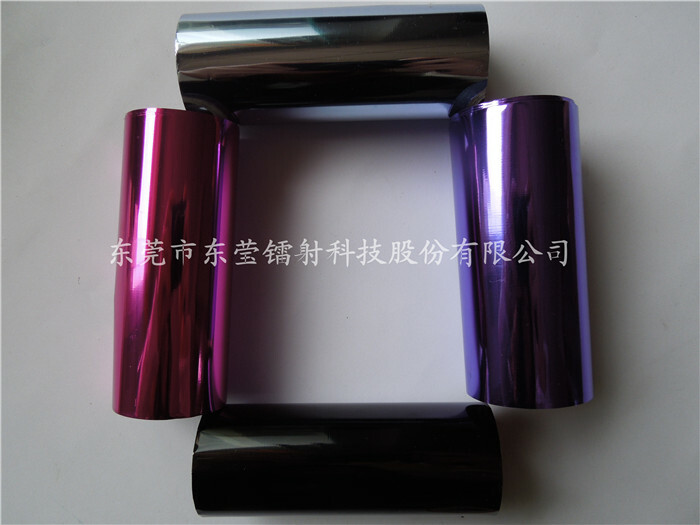 Textile foil is one of the most popular hot stamping foils in the world. It is used on the cloth. And it has good gloss which is better than ink. The cloth that it hot stamps won’t fade after washing many times due to its strong washing fastness. We can hot stamping several different kinds of patterns according to different requirements. The garments after hot stamping are more elegant and fashionable. Now it has been accepted by more and more people. Main advantages: It has good hot stamping performance, good resistance of high temperature, strong washing fastness and shinning colors. It can be stripped easily. Different size of patterns can be satisfied according to your needs. Applicable scope： It used on different kinds of cloth. Color: silver, gold, slight gold, dark gold, gold silver, red, blue, green, purple, laser gold, laser silver, kinds of laser patterns. Classified: It can be divided into the standard and the laser. Laser foils are bright, and have lots of patterns. Colors of gold, silver, red, green, blue, black, transparent, and so on are all available. Double-sided textile foils we produced have stronger washing fastness than one-sided textile foils. Products with different thickness, width, length can be satisfied according to your requirements. We have produced 16μ*75cm、 23μ*75cm ones for customers. Or the specification of 15μ*1.5M*1000M is also ok. Environment guarantee: The authorized specialized test environmental proof, such as ROHS、EN71、REACH 38、phthalate 16P、ASTM-963-08、91-338-EEC.